As if the new S550 platform wasn’t exciting enough, Shelby American’s Super Snake is back for the 2015 model year. This Super Snake was designed with us fans in mind as well as our fellow car nuts overseas. The 2015 will also mark the first time the Super Snake has an automatic transmission option. Key word “option”. Don’t worry, the six speed from before wasn’t eliminated–It’s an option as well. How many of these monsters are they building? Only 300 of these beauties are available, fewer than the 2014 by 200, and with the international market involved, getting your hands on one might be a bit difficult. The small numbers certainly won’t stop anyone from building their own dream serpent on Shelby American’s site. Like the previous snakes, there are two options available to prospective buyers. The first is a 650+ horsepower variant in the $50k range, and the second is a 750+ horsepower model in the $55k range (not including the base Mustang GT). Both builds are designed to run on pump gas. The exterior gets the iconic Super Snake styled hood in carbon fiber along with a number of other carbon fiber add-ons: a front splitter, rocker panels with aero blades, a rear diffuser, a rear spoiler, taillight panel, and mirror covers. The interior has a host of amenities as well. A carbon fiber gauge pod, a short throw shifter from Ford Performance, and other accents bearing the Shelby name. On the drivetrain side of things, Shelby American is sticking with Wilwood’s 6 piston front brake setup and Ford Performance’s suspension and handling mods. Ford Performance’s supercharger also gets to stick around for the 650 horsepower snake, and the engine will roar through a Borla exhaust accented with Shelby tips. 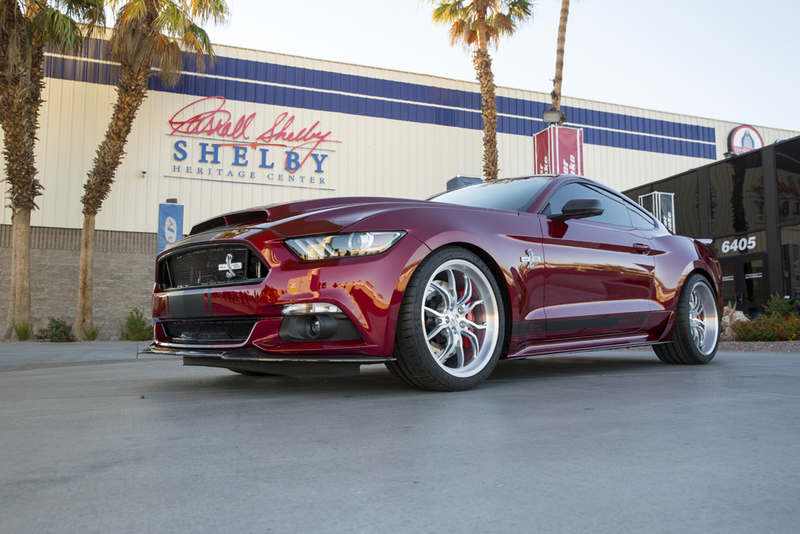 Lastly, Shelby American opted for light weight, one piece forged Weld Racing rims shoed with Michelin tires. So what does the extra five grand get you? A more powerful supercharger for one (remember Whipple and Kenne Bell?). This 750 horsepower model is more track oriented than its brother, and to quote Akos J. Feher, Shelby American’s Vice President of Operations, “After extensive testing and development on the racetrack and street, we feel that this is our best supercharger performing and sounding, muscle car to date.” The extra money also goes into a rear brake upgrade, a four piston Wilwood set, differential and transmission coolers, a one piece driveshaft, caster/camber plates, and racing seats complete with 5-point harnesses. If you’re planning on showing this beast off at the track, we’d say these are must haves. Since its inception, Carroll Shelby wanted the Super Snakes to be a balanced car, capable of taking your kids to school, cruising with the gang, or ripping up tarmac on either a drag strip or a race track. Most important of all, Shelby wanted staying power. By which he meant he wanted each model of the Super Snake to handle years upon years of daily driving and track life. In 2008 Carroll Shelby described that year’s Super Snake by saying, “You can drive a GT500 with the Super Snake package everyday. Then hit the dragstrip on Saturday night, bolt on some slicks, and run 10-second quarters. Take off the slicks, drive it home and then to the road course the next day to pick on the Porsches. It’s the ultimate American muscle car.” Looking at the build list, (especially the cooling package for the 750 hp version) we can see how Shelby American continues to honor Carroll’s philosophy. Shelby American’s Vice President of Marketing, Gary Schechner, says, “The first generation Shelby Super Snakes are among the hottest collectible cars in history…Carroll Shelby would have loved this car.” Without a doubt the lucky 300 owners of the 2015 snake will love it too. The rest of us will continue to look forward to what Shelby American will dream up in the coming years.